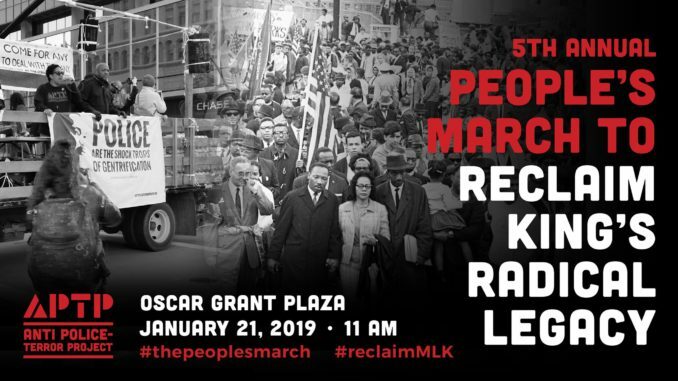 #THEPEOPLESMARCH – the fifth Annual March to Reclaim King’s Radical Legacy….A mass mobilization. 11:00 am – 1:30 pm – Program & March! ASL interpretation will be available for some parts of the day’s programming. For the 5th consecutive year, the Anti Police-Terror Project calls the Bay Area into the streets for the People’s March to Reclaim MLK’s Radical Legacy. MLK’s legacy has been whitewashed for many decades. The state would have us believe he was a passive figure. The truth is he was a radical leader, unshakable in his demands for rational change: an end to capitalism, to war, to empire, to poverty, and to white supremacy. We take this opportunity every year to celebrate the true spirit of this revolutionary. January 2019 marks the 10th anniversary of the murder of #OscarGrant. This year on #ReclaimMLK Day, we honor the mothers of those lost to police violence, and lift up their resistance and resilience. It’s also been another 10 years of gentrification. Another 10 years of displacement. Another 10 years of a worsening houselessness crisis. Another 10 years of the Bay Area’s elected leaders putting profits over people. Another 10 years of government for and by developers, tech companies, and banks – instead of for and by the People. The People have had enough. For seven months, we waged a People’s Campaign for a just and equitable Oakland. Our campaign galvanized tens of thousands of Oaklanders and most importantly, it did not end in November. We continue that Campaign and its demands into the new year. On Jan. 21, we march for justice for all victims of police terror and their families. We march for housing as a human right. We march for a just economy that meets everyone’s human needs. We march for real community safety, which means defunding the police to invest in our communities. We march for quality education for all our kids. We march for real sanctuary in the Bay. We march for a sustainable climate and healthy environment for all families. We demand a Bay Area for All of Us. We demand a Bay Area for the People. – Housing as a human right: truly affordable housing for all in need, immediate shelter for our unhoused neighbors, and public land for public good. – A just economy that works for everyone, puts people over profits, provides living wage jobs with dignity for all, requires corporations to pay their fair share to do business in our cities, and ensures that any development benefits the community. – Community-based public safety: Invest in prevention, not criminalization; make all police use of force transparent and accountable. – Quality education for all: Fair pay for teachers. No cuts, no closures, no more charters. – Real sanctuary for all: Abolish ICE, end criminalization of our most marginalized, and guarantee the safety of all queer, Black, Brown and Indigenous communities. – Environmental justice: clean, air, water, and safe food supplies for all.